Fragaria (the strawberries) is a monophyletic genus of the family Rosaceae (sub-family Rosoideae) consisting of approximately 24 species representing ploidy levels ranging from diploid (2n = 2x = 14) to decaploid (2n = 10x = 70). The wild members of the genus are distributed throughout the northern hemisphere and along parts of the western side of South America; while the primary species of cultivation and commerce, octoploid (2n = 8x = 56) Fragaria x ananassa, is grown throughout most of the world. Evolutionarily, F. x ananassa is among the youngest of crop species, having arisen in France in the mid-1700s as a hybrid between two octoploids: a white-fruited female clone of F. chiloensis ssp. chiloensis f. chiloensis brought to Europe from Chile; and a red-fruited, hermaphroditic form of F. virginiana ssp. virginiana brought to Europe from northeastern North America, likely from the St Lawrence River Basin in what now is Canadian territory. Thus, the immediate ancestry of the octoploid, cultivated strawberry traces to the Americas. The only Fragaria species of lower ploidy known to be endemic to North, South, and Central America is Fragaria vesca (see details under separate F. vesca species description). The extant distribution of Fragaria vesca species diversity ranges from Eurasia to eastern Asia. Multiple diploid and tetraploid species, a hexaploid species (F. moschata), a decaploid species (F. iturupensis) along with various odd-ploid hybrid forms, but no known octoploids are present in eastern Asia. A new decaploid species, F. cascadensis, with limited distribution centered in the Cascade Mountains of Oregon, has recently been described. The strawberry fruit is variably described as an accessory fruit or an aggregate fruit. 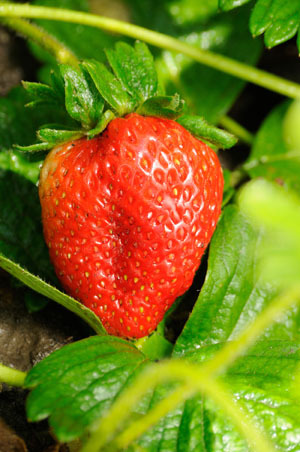 The true fruit of the strawberry are the dry, “seedy” achenes, which stud the surface of the enlarged, fleshy receptacle. Cultivated strawberry plants are typically hermaphroditic and self-compatible; however, gametophytic self-incompatibility and alternate forms of sexuality such as dioecy, subdioecy, and gynodioecy occur in various Fragaria species. Strawberry can also reproduce vegetatively via rooting of runner plants or stolons. For commercial production, strawberry is propagated clonally; however, F1-seed-based propagation is now being implemented on an increasing scale in international settings. Two diploid species, F. vesca and F. iinumae, have been identified as likely subgenomic contributors to the genomes of the octoploid Fragaria species. Other diploids may have contributed genes or subgenomic components as well. The specifics of the reticulate evolutionary pathway from the diploid to the octoploid level remains to be elucidated. Extensive genomic resources have been developed in F. vesca (see F. vesca description), and complementary efforts are in progress in F. iinumae. Genome sizes (1C values) in the diploid Fragaria species are about 240 Mbp, while those in the octoploids are about 800 Mbp. Available Fragaria transcript data in GDR . Click on the Transcript Assembly name for more detailed information. The Fragaria Reference Transcriptome (Fragaria RefTrans v1.0) from published RNA-Seq and EST data is coming soon. Whole Genome Sequences & Annotations for Potentilla micrantha, a closely related species that does not produce berries.